Thinking about a career change or studying Art, Craft or Design at university? 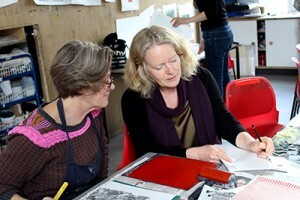 Do you just want to develop your creative practice further? Enrol on a course that will help you to further develop your interests, talents and skills in the visual arts. Complete the short application form, come to an informal interview with some examples of your art work to show the tutors and we can find the right course for you. The courses below run over three terms from September 2018 to July 2019 with the exception of Working in Community Arts which runs from January 2019 to July 2019. Additional learning support is available. Click here for an application form for this course. The following non-accredited Higher Level courses offer an alternative to the University route and are benchmarked to an appropriate standard. You may be eligible for some financial help towards the costs of your studies. Please ask at reception for further information. The Advanced Learner Loan is a government-funded loan to help learners. It’s easy to apply for, doesn’t take your household income into account and doesn’t involve a credit check. Here are some key facts about the loan: Repayments are linked to what you earn and not how much you borrowed. You only have to start making repayments when you’ve finished your course and you’re earning over £21,000 a year (which is £404 a week or £1,750 a month). Until then you don’t need to pay back anything, but you can make voluntary repayments at any time. You pay 9% of the money you earn over £21,000, before tax. For example, if you earn £22,000 a year, your monthly repayment will be £7 a month; and if you earn £35,000 a year, it will be £105 per month. Interest is charged on a sliding scale between the Retail Price Index (RPI) and RPI +3%, depending on how much you earn. For more details about applying for a loan to pay for your course please follow this link https://www.gov.uk/advanced-learning-loans To read more about the loan, download the Advanced Learner Loan Information Leaflet by clicking here.